This playful mural was commissioned by the architect Hugh Randolph for the outside of his downtown office. Hugh wanted something that greeted the morning commuters on their way to work. 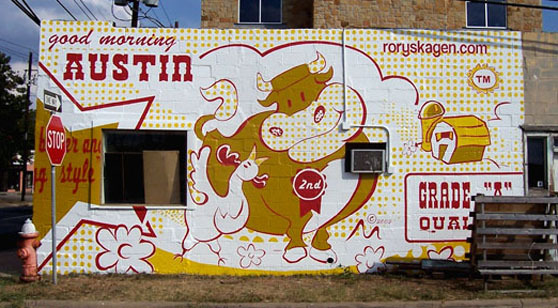 This 14′ tall by 32′ wide mural also gives homage to another once popular mural painted in downtown Austin by us, “Blue Ribbon Day”, that was unfortunately painted over in 2001. This entry was posted on Saturday, January 29th, 2011 at 5:46 pm. It is filed under Business, Exterior, Featured. You can follow any responses to this entry through the RSS 2.0 feed.